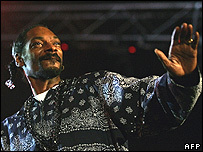 Rapper Snoop Dogg is to present the MTV Europe Music Awards in Germany this November, the network has announced. He steps into the shoes of last year's host Justin Timberlake, with whom he duetted on the 2005 hit single Signs. "I've called up the homeys from East to West and I guarantee it's gonna be off tha chain, ya dig," said the rapper in a statement. Rock band the Foo Fighters and pop star Mika will perform at the show in Munich's OlympiaHalle on 1 November. Last year's winners included hip-hop duo Gnarls Barkley and pop singer Justin Timberlake, who picked up two prizes apiece. California rockers Red Hot Chili Peppers were nominated in four categories, but only took home the best album prize for the double disc Stadium Arcadium. Kanye West, who received the best hip-hop trophy, stormed the stage in disgust when he lost the best video prize to dance act Justice vs Simian. "If I don't win, the awards show loses credibility," said the rapper in an expletive-filled tirade. West went on to explain that his video for Touch The Sky deserved to win because it "cost a million dollars, Pamela Anderson was in it, and I was jumping across canyons". Nominations for this year's awards will be revealed later and MTV viewers across Europe will be given the chance to vote for their favourite acts. There will also be a new category, called New Sounds Of Europe, with breakthrough acts from 19 European countries vying for the prize.